The common mole shown here is 1 millimeter in diameter (the width of the tip of a sharpened pencil). A common mole is a growth on the skin that develops when pigment cells (melanocytes) grow in clusters. 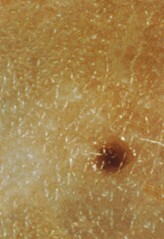 Most adults have between 10 and 40 common moles. Another name for a mole is a nevus. The plural is nevi. Although common moles are not cancerous, people who have more than 50 common moles have an increased chance of developing melanoma.